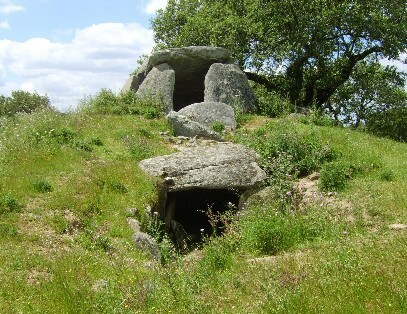 Location: N2, São Geraldo, Nr Evora, Alentejo. Grid Reference: 39° 14' N, 7° 40' W.
Commenda da Igreja: (Passage Mound). 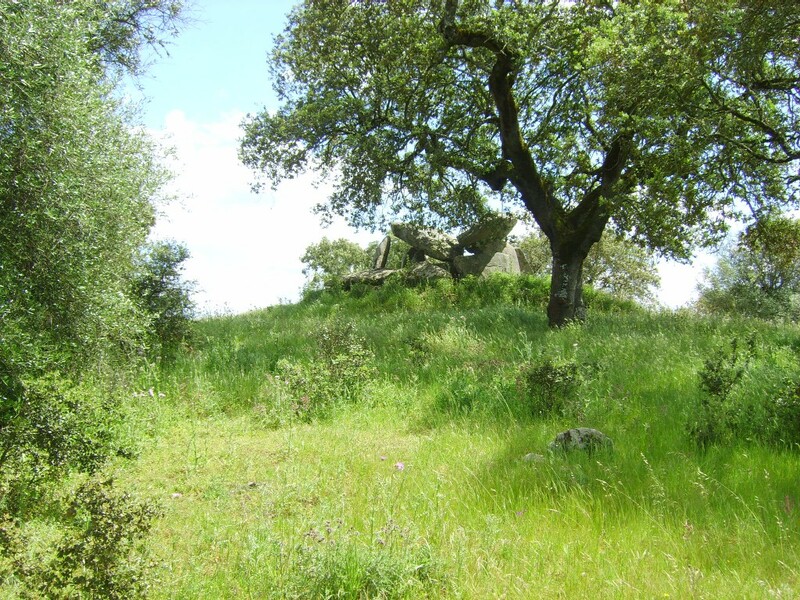 This is considered the second largest passage mound in Portugal... 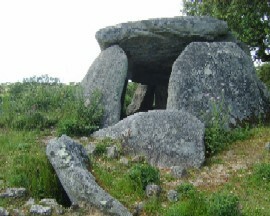 Although the main structure is surrounded by a large mound, it looks as if the top stones were always meant to be protruding above the structure. Another jewel in Portugal's megalithic crown. A must for all lovers of megaliths. 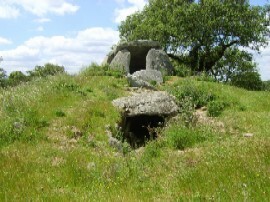 While the internal design of this structure is reminiscent of other Alentejo structures mounds such as those at Tapadão and Zambujeira, Zambujeiro was strictly a passage-mound, being originally completely covered, while this and Tapadao share the fact that they were probably always only half covered. 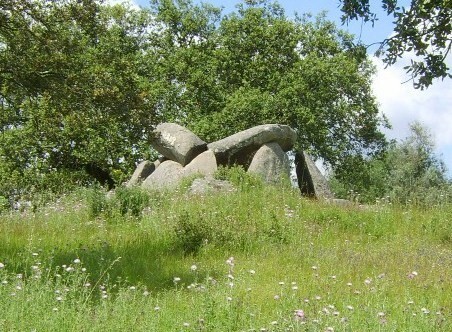 Strictly, this is neither a dolmen nor is it two dolmens. 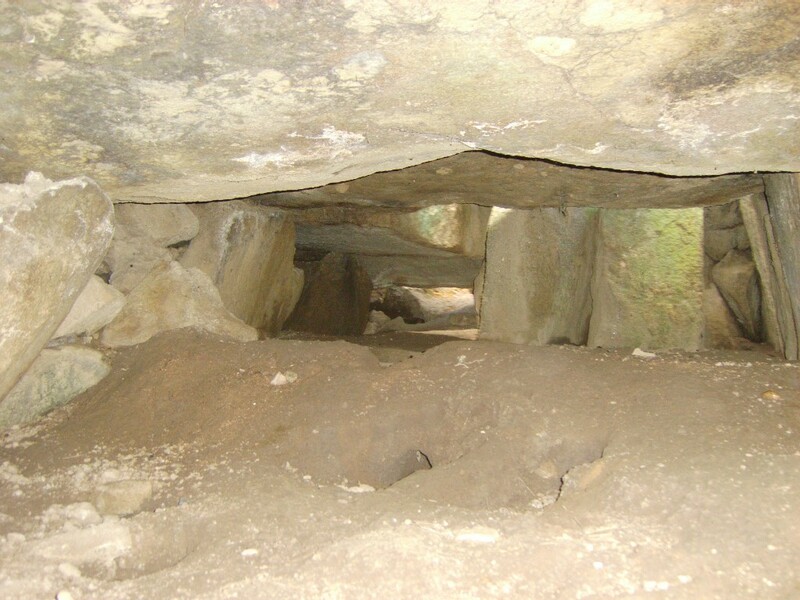 It is a chamber built with 8-upright stones, 'capped in the style of a dolmen', but built to include a passage, then partially covered over with a mound. 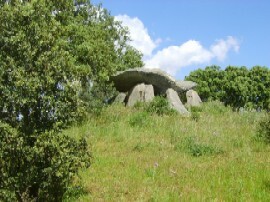 The result is a passage-mound with protruding dolmen. The capstone is also broken in half, possibly due to lightning strike. 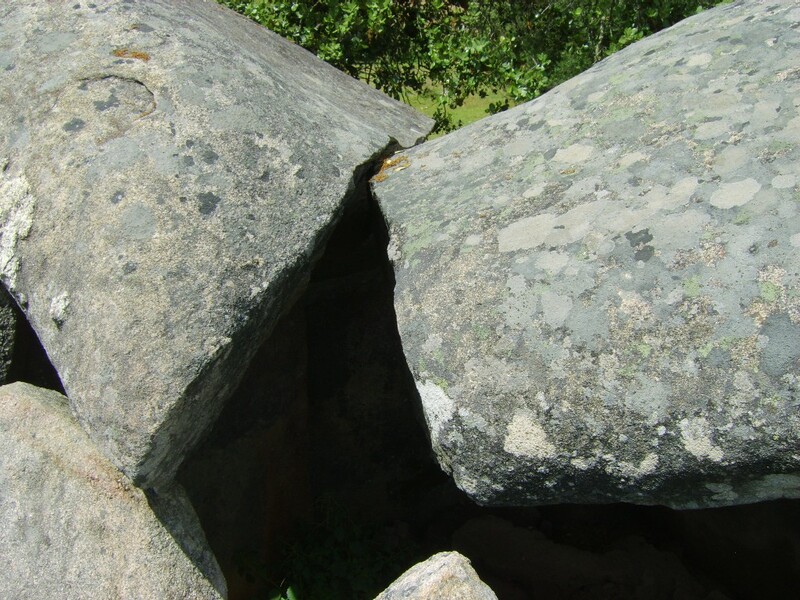 It is important to note that the hole at the top is only there because the stone that was originally there has slipped and broken, as the picture above shows. Built near a stream, but with a poor view of just over a mile in all directions. The reason for placing this mound here remains a mystery. In any case, the site has a fantastic atmosphere and is worth the extra effort to get there. The large size of the mound becomes apparent from behind the structure. The 8-uprights that compose the walls of the central chamber are exposed to a height of around 3m, but are likely to be at least another metre longer in order to reach ground-level beneath the soil-filled chamber. The inside is filled with soil and a rabbit warren. 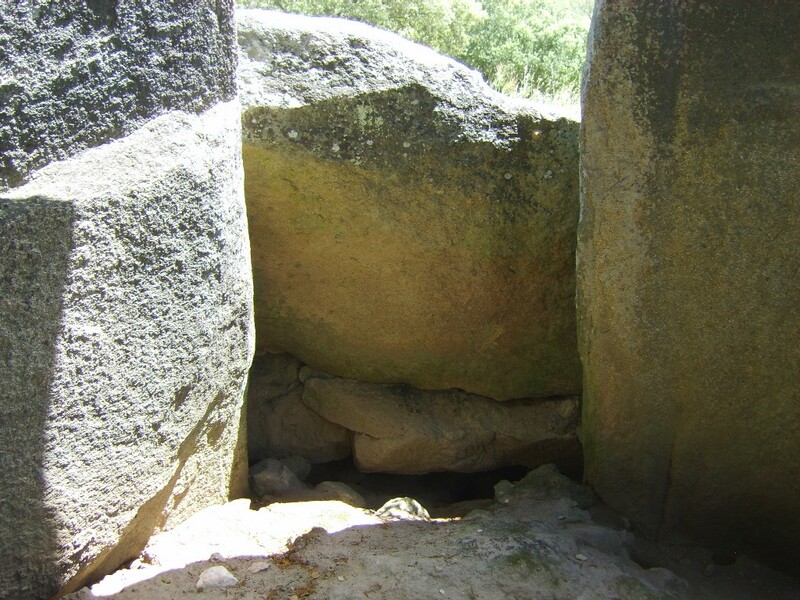 Orientation - The passage is orientated at approximately 110°, similar to Tapadao, and several other Portuguese Dolmens. It is suggested that this orientation may have been towards the spring moon, or the rising of Pleiades (the seven sisters), a common celestial orientation, as it was considered the beginning of the agricultural year in several ancient cultures. 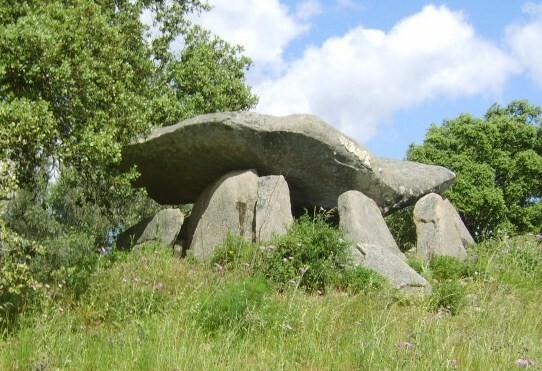 There is apparently a second, smaller and destroyed, dolmen nearby - compounding the idea that Portuguese megaliths often appear to be found in pairs (although I was unable to find it).